When the pure light of Islamic literacy and knowledge shadowed by the darkness of so called self-constructed and personal oriented Islam----when the heart and soul of the Muslim Ummah became confused----He one of the most qualified, learned and spiritually strengthened personalities----acted like a guiding star and became the beacon for those who had the thirst to seek the classical knowledge of Islam and for those who wanted to follow the Sirat-i-Mustaqim (the straight path). He was highly respected for his excellent approach and efforts to remove the mask of misconception surrounding the true interpretation of Islam. He was the son of Mufti Shah Muhammad Mazhar Ullah Rahmatullah ‘Alayh, the great Mufti, Khatib and Saint (d. 1966 c. e) of Delhi (India). Maulana Jawaid Iqbal Mazhari (Founder of Imam-i-Rabbani Foundation, Karachi) etc. 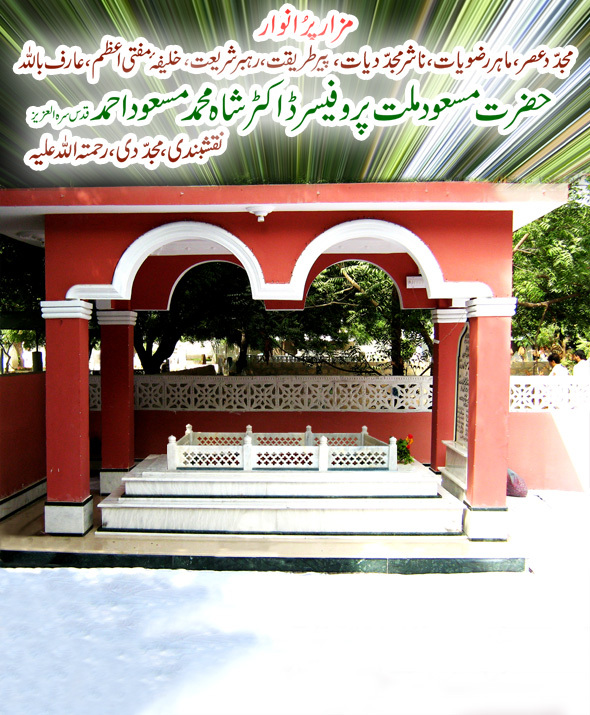 The eminent Professor and great Saint of the Naqshbandiyyah Order left this temporal abode on the 28th April, 2008 leaving behind a rich literary legacy. May ALLAHU TA‘ALA grant him a high station in Jannah (Aameen Suma Aameen).